Serenity Now: Hometown Seeds Discount! I was a little bummed that we didn't get our vegetable garden in this year, until I received an email from Hometown Seeds. I've heard about them on the radio, and read about them over at Kim's. I certainly don't want to sound like one of those people who stands on an actual soapbox on the National Mall with a cardboard sign that says "The End is Near!" But I will say that we live in uncertain times, and I very much liked the idea of having something to fall back on to nourish my family in a time of crisis. 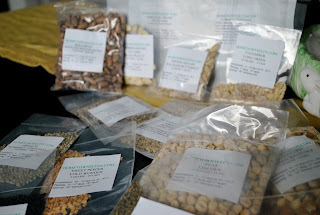 Hometown Seeds sent me a Survival Seeds Pack, which is their best seller. These aren't just packs of seeds that you can pick up at Wal-Mart. Non-hybrid seeds allow you to plant a crop (3/4 of an acre's worth in the pack I was sent! ), harvest, and then replant using "true to variety seeds" for future harvests. It is, quite honestly, the gift that keeps on giving, as corny (no pun intended!) as that sounds. The very best part? The seeds will store for 5 years on a shelf, and 10 years in a freezer! When I saw that the set they were sending would include 16 varieties, I was expecting a large unwieldy package that would be impossible to store. I was pleasantly surprised that my seeds arrived in record time and they were very efficiently packaged in one large bag containing separate seed packs. Hometown Seeds also included a detailed and helpful booklet of instructions. The pack easily fits in the top basket section, and I included the booklet with it so we don't lose the information. Their Survival Seed Bank includes 35 heirloom varieties--over 24,000 seeds with the same storage life as the pack I received. Enough to plant over 2 acres. You, my readers, know that I don't review or endorse products on this blog that I don't think are worth my time (or yours!). I hope those of you who spend time gardening, canning, and cooking will enjoy this post...and the discount that Hometown Seeds is offering my readers! *Between now and July 31st, 2010, you can receive 20% off the total of any order by adding the coupon code thanks. How cool is that and ooh 20% who doesn't like that! This is awesome, thank you! We have a fairly successful veggie garden but I will definitely try these! PS...Check out my new blog name...hehehe I am SO excited! It is neat, and there are a lot of seeds in there. We used some this year, but we certainly have nowhere near 1/4 of an acre to plant. I will check this out. My garden has ended up being a disaster this year with the heat and critters. I've kept out the deer but the squirrels and a groundhog keep getting into my fortress. I hope you'll get to use some of your seeds next year. Thanks for the info =) I'm always on the lookout for companies that sell heirloom seeds! I've never heard of these before! I'll have to check them out!